Later on, this could be mitigated by the generally-more-natural backstage scenes in which the guest would take part, often as the focal point of the story, but at this point, a non-singing guest feels more like something they had to work around than a true fit to the show or the characters, since, ironically, in the first season, comedy wasn’t always the show’s strong point. Or at least, traditional sketch comedy wasn’t. Better humor came from the performances than the writing, as well as from the meta aspect of it being a show-about-a-show, rather than from the on-stage comedy scenes. Unless things happened to “go wrong” in a sketch, which, of course, brought the meta to the stage. But, in this episode, none of the sketches “go wrong,” and, ironically, that’s a big part of the problem, as none are that interesting on their own. Because Peter Ustinov and the Muppets were both so phenomenally talented, some magical interactions happen between them, but it’s rarely due to the script. Take, for example, what is probably his best scene, in which he and Fozzie stand at podiums in collegiate caps and gowns, while he tells a bad joke in a New Yawk accent. A venerated British actor who won 2 Academy Awards, Ustinov was also a master of dialects and impersonations, a skill he shows off throughout the episode (it’s particularly thrilling to hear him do a royal English accent in his scene with Dr. Honeydew that sounds exactly like the one he used for Prince John in Disney’s beloved Robin Hood). But even this, his best scene, is unnecessarily drawn out. There’s no particular need for the academic milieu. When Sam introduces Ustinov and Fozzie, he says that they are going to be discussing post-Dickensian economics, and that doesn’t happen at all. The only link is that the joke is about saving money, and it ultimately leads to a very bad pun punchline. 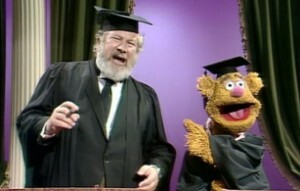 What makes it worth it, however, is Ustinov and Fozzie’s chemistry. Fozzie seems so thrilled to be sharing the stage with this legend, and Ustinov builds off that energy so beautifully that, by force of charisma on both of their parts, it turns into a delightful scene. Ustinov seems to be having the time of his life being surrounded by the Muppets, playing a “robot politician” in the aforementioned Honeydew scene (another pre-Beaker appearance by the scientist), in which he gets the opportunity to do a string of political impressions, including Winston Churchill and Nixon (the latter very timely at the time! ), as well as, later on, in a debate sketch, in which he plays a German pscyhiatrist who spits when he talks, but, again, none of these scenes are particularly great examples of The Muppet Show. There’s a bit of Muppety chaos in the debate sketch, as there always is, but nothing truly classic or memorable. And, while the backstage scenes again revolve around the guest star, as they did in the previous episode with Lena Horne, he never takes part in them himself, and since, again, he isn’t in any songs either, he seems more cordoned off from the rest of the show than many guest stars, particularly given he doesn’t even appear in the episode’s climax, a solo rendition of “Bein’ Green” by Kermit, which acts as the culmination to the episode’s “plot”. Kermit works through his emotions in song. 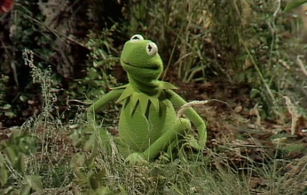 It’s great to see the characters start to get fleshed out beyond their initial formula, particularly Kermit. We’ve seen Kermit spurn Piggy’s advances numerous times by this point, but this is our first hint that, even if it’s too early to say that Kermit has feelings for Piggy, he at least actually secretly likes the attention she gives him, despite himself. Along with the fact that our otherwise levelheaded host can sometimes get hot under his pointy froggy collar and lose his temper, it’s another little layer that helps make him a well-rounded character. The fact that he sometimes either acts against his own interest or against what he thinks he wants are among the first signs he is starting to grow more complex than the otherwise often overly simplistic first season scripts have delivered up to now. Granted, you have to put aside the fact that Kermit didn’t get this upset when Piggy had the hots for Jim Nabors to accept this turn.